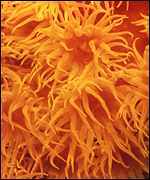 To view the underwater image of your choice, please click on one of the text links below. Text links on this web site are designated by blue text which changes to orange as you pass over it with your mouse. Text links are not underlined. To return to another gallery click on the large navigation text below or use the links contained in the filmstrip image map above. All navigation is also available at the bottom of each page. Underwater narrative -- "The Journey Home -- Tales of Wayne, the Turtle Man"
Underwater narrative -- "Cozumel -- Into the Deep"
BBC web article -- "Ten Richest Coral Areas Pinpointed"
Scientists have listed the world's 10 most important coral reef areas for the first time. Each is home to a wide range of endemic species (those with a restricted range). The scientists say their work should help to target conservation work more successfully. But they say 25% of the world's reefs have already been destroyed or badly damaged by problems arising from climate change. They say 58% of reefs are reported to be threatened by human activities. The scientists have published their findings in the journal Science and are reporting them to the annual meeting of the American Association for the Advancement of Science in Boston, US. The 10 hotspots, according to the degree of threat they face, are the Philippines; gulf of Guinea; Sunda islands (Indonesia); southern Mascarene islands (near Madagascar); eastern South Africa; northern Indian ocean; southern Japan, Taiwan and southern China; Cape Verde islands; western Caribbean; and the Red sea and gulf of Aden. The researchers identified the 10 areas by mapping the geographic ranges of 1,700 species of reef fish, 804 corals, 662 snails and 69 lobster species. They then compared these with known threats to coral reefs from human impacts. 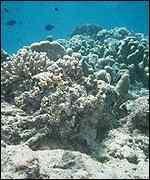 The 10 areas contain 24% of the world's reefs, but 34% of endemic species. Threats include farming, deforestation and development, which can leave the reefs struggling against sediments, nutrients and other pollution. Intensive fishing, sometimes with dynamite and poison, is also devastating. The authors write: "Marine species have long been considered resilient to extinction because of their large geographic range sizes. "Widespread reef degradation could lead to a gathering wave of extinctions. "Many centres of endemism are deeply at risk and can be considered analogous to terrestrial biodiversity hotspots. "Without rapid conservation action, species will be lost." The scientists say concentrating conservation on the hotspots could be highly effective, but it should extend to reef "wilderness" areas "and must include efforts to mitigate climate change". The lead author of the report is Dr Callum Roberts, of the University of York, UK. He said: "We know that unless we take action right away, marine species will start going extinct. "This study can help us create an urgently needed strategy that targets the places where biodiversity is bleeding away most rapidly." Dr Roberts said marine reserves out of bounds to fishing were needed immediately. They would be economically beneficial as well as effective, he said. The research was funded by Conservation International, and Unep-WCMC (the United Nations Environment Programme World Conservation Monitoring Centre) provided data. The lead author of Unep-WCMC's World Atlas of Coral Reefs, published in 2001, is Dr Mark Spalding. He told BBC News Online: "This research is critical for helping us to focus on the threats, but we mustn't forget what's not in the hotspots. "It's shown us that the unique reef populations and habitats are scattered across the globe. "It's also shown us that an assessment of the world's reefs we did in 1998 was over-optimistic. "Three of the 10 hotspots are in south-east Asia. But the World Resources Institute (WRI) has just published a report showing that 88% of the region's reefs are severely threatened by human activities." 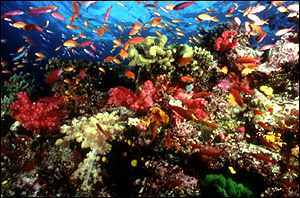 South-east Asia contains one-third of the world's reefs. The main threats are over-fishing, fishing using destructive methods, and the spread of sediment and pollution from the land. The WRI report is entitled Reefs at Risk: South-east Asia. Copyright © 2001 by Willis Greiner and Cheryl Price. All Rights Reserved. All images on this site are for viewing only. Images are not to be reproduced, distributed, circulated, offered for sale, or given away, in any form, by any means, electronic or conventional.